Happy Monday! Hope everyone had a great weekend! I cannot believe that it is already February! This year is sure going by quick! This is my very casual outfit with a touch of fire red! These shoes are great because they have a low heel and are comfy to wear! I think I might need to save to buy this shoe in each color! Don't you love a heel in a lower height? These are so cute and I love your bracrlets. I'm loving how casual yet elegant this outfit is. It's simple and stylish and you look great! Jac, you my dear are FIERCE!!!!! Even when cute and casual, you still find a way to fire the look up!! Love it lady!!! love the outfit!!! 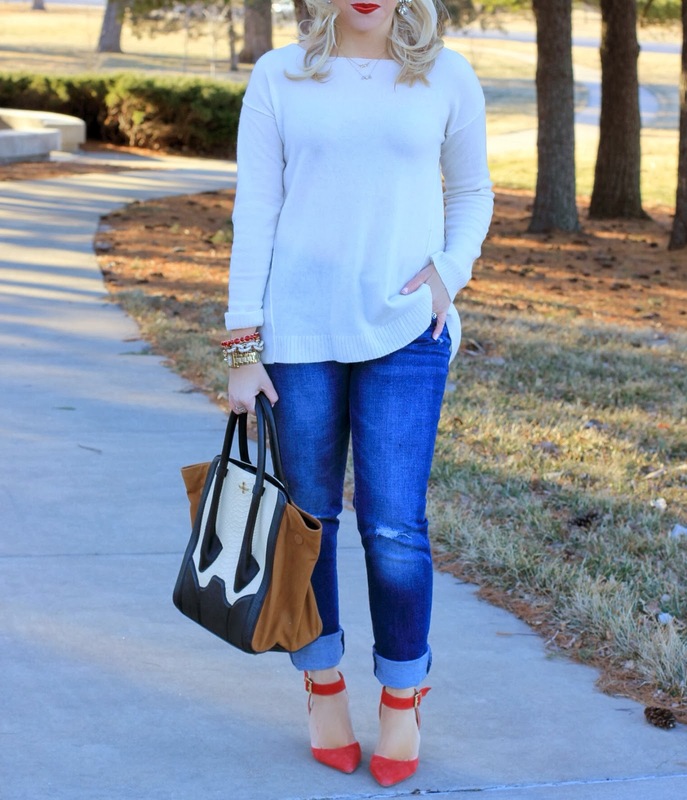 The shoes added glamorous into this casual outfit! fantastic look! so chic and classy! that purse is lovely! Love the ice blue with the red, such an unexpected but perfect color combination! Love the bag and fiery shoes! Great outfit because it looks both relaxed and chic. Those shoes are the cutest! I love finding comfy shoes with a modest heel that I can wear all day. Perfect simple outfit. 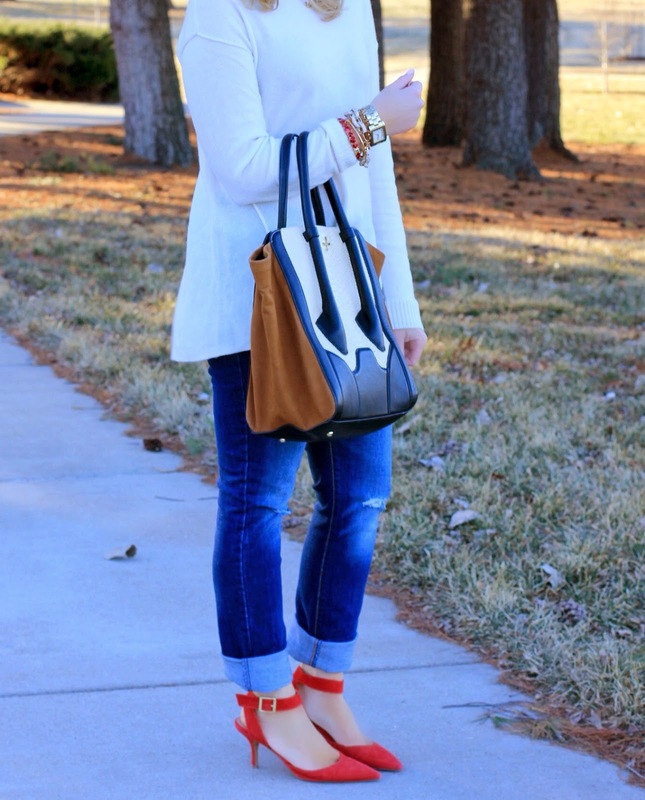 The red really works with the neutrals! The shoes are incredible and so is the lipstick. Don't you just feel like tackling the day when you have such a fun bold lip? I felt unstoppable with mine this morning. The shoes are perfect...changed the whole look of the outfit! Duh, posted this comment on a different post. LOL. So cute!! 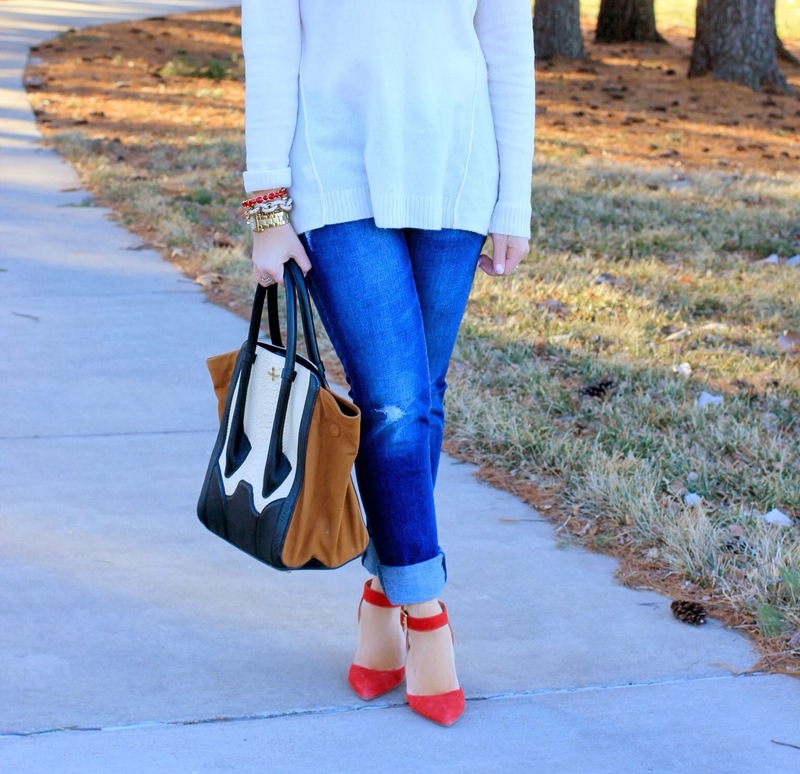 Love that oversized sweater and the red heels look great!! Obsessed!! Love a fairly neutral look with pops like that-- fiery is the best way to describe it! The shoes/lips are a great pop of color against your neutrals. Those shoes are seriously amazing!! I love the simplicity of this outfit! Love the bag but the red lip color is my favorite!